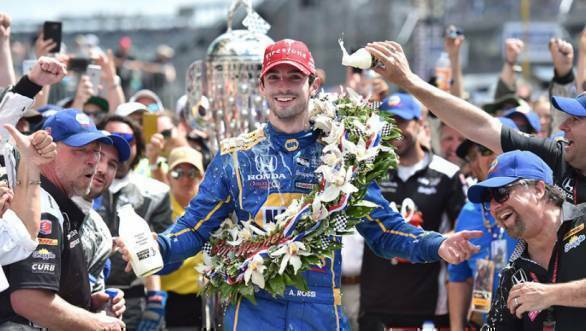 Alexander Rossi has become the first rookie in the past 15 years to win the Indy500. The former F1 driver also has the distinction of being the winner of the 100th edition of the famed Indianapolis 500, which essentially also means that he is the event's 100th winner. While it didn't really look like Rossi would win the prestigious race during the early stages of the 2016 edition, a particularly canny fuel strategy came to his rescue, leaving him the surprise winner at the old Brickyard. The defining moment of the race was when Mikhail Aleshin's car debris needed to be cleared away from the track, after an incident that also saw Conor Daly retire from the race. While the rest of the front runners took the opportunity to pit when the track was green, Rossi pitted under yellow flags, managing to stay out for the remaining 50 laps, while the other drivers needed to stop for fuel once again. It wasn't exactly smooth sailing for the American driver through those 50 laps though. After all, the closer he got to the chequered flag, the more it seemed like he would run entirely out of fuel. It turns out he had just enough fuel to cross the finish line, fortunately only running completely out of gas on the slow-down lap. It was a terrific result for the Andretti team, with Carlos Munoz, Rossi's team-mate, finishing a strong second place. Joseph Newgarden finished third, with Tony Kanaan fourth. In fact, before Rossi got to the head of the pack and stayed there, it was Munoz, Newgarden and Kanaan who were battling it out for the win at the 2016 Indy500. Charlie Kimball finished the race fifth, followed home by JR Hildebrand, while pole man James Hinchcliffe could do no better than seventh place. Scott Dixon, Sebastien Bourdais and Will Power completed the top 10. Unfortunately for 2015 winner Juan Pablo Montoya, his race ended in retirement on Lap 63.